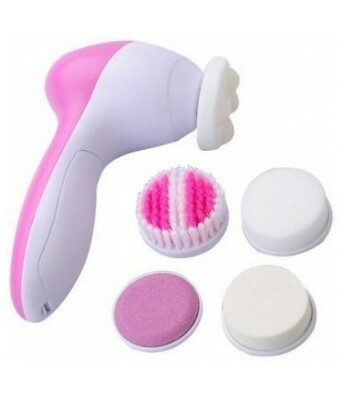 5 IN 1 BEAUTY CARE MASSAGER, BRUSH, POLISH, & SPONGE ATTACHMENTS This 5 in 1 Beauty Care Massager has 5 stages of exfoliation and body revitalizing heads as stated in detail below : 1. Rotating Pumice stone function -(functions as an Exfoliator for removing dead skin cells to reveal a roseate & youthful skin. ) 2. Rotating Brush - ( brushes away dead skin after using Pumice stone rotator to remove cracked or hard skin around your heels or elbows ) 3. Rotating Sponge (Rough) - (cleans and exfoliates all of your body surface before applying medication or cream. 4. Rotating Sponge ( Soft ) - (cleans and exfoliates face and removes make up before applying medication or cream. ) 5. Rotating Massage head (relaxes tensed areas around your body by improving blood circulation around areas such as the neck, arms, shoulders, etc to provide you with an extra boost to continue your day full of renewed energy. ) Notes & Care Tips : *Clean all the accessories with water (do not use alcohol, gas or detergent) and keep the temperature within 50 degrees Celsius. *Keep the inner part of the cleaning brush clean. *Please air-dry the unit after long-time use. *Keep away from dry, rough, or sensitive skin, and skin with acne or sun burnt skin. *Softly and generously massage your skin with the cleaning brush. *Please spend less time using the brush on your neck surface as it has thinner skin thickness compared to other parts of the body . *Keep accessories clean and hygienic for long lasting and comfortable use. *Please keep accessories away from children as it might cause choking hazard.